Ocular chrysiasis is a deposition of gold in ocular structures secondary to gold salt therapy, which is primarily used in infectious, rheumatoid and psoriatic arthritis. Gold therapy has become an extremely rare treatment due to the advent of rheumatologic medications with better safety profiles. However, any patient who has undergone gold therapy could potentially have ocular chrysiasis. Therefore, it must be included as a differential in the presence of corneal or lenticular changes in these patients. Additionally, it is important to include ocular chrysiasis as a differential in the presence of crystalline keratopathies. A detailed medical history and thorough ocular examination can assist clinicians in making a correct diagnosis. The following case report is meant to be used as a guide in teaching optometry students and residents. It is relevant to all levels of training. Ocular chrysiasis is a deposition of gold in ocular structures following chrysotherapy, which is the medical use of gold salts. Chrysotherapy was primarily used to treat infectious, rheumatoid and psoriatic arthritis. This therapy has become an extremely rare treatment due to the advent of rheumatologic medications with better safety profiles. Any patient who has undergone gold therapy could potentially have ocular chrysiasis. Therefore, it must be included as a differential in the presence of corneal or lenticular changes in these patients. This case illustrates the importance of history-taking skills, examination and decision-making in effectively diagnosing this condition. A 54-year-old Caucasian female presented for an annual eye examination. She reported a haze to her vision in bright conditions, as if she were continually looking through “dirty glasses.” She was wearing progressive lenses, primarily for reading. Ocular history was positive for dryness, seasonal allergies, bilateral LASIK in 1999, and past bouts of iritis. The patient was using a fish oil supplement and artificial tears as needed for dry eye. Her allergies were being treated with olopatadine hydrochloride ophthalmic solution (Pataday) and prednisolone acetate (Pred Forte), as needed, as prescribed by her previous optometrist. Family ocular history was positive for dry age-related macular degeneration on her mother’s side. Her medical history was significant for high blood pressure controlled with hydrochlorothiazide and triamterene, migraines controlled with rizatriptan, diastolic dysfunction and heart block controlled with a pacemaker, and occasional oral herpes simplex treated with valacyclovir. In addition, she had a history of psoriasis, psoriatic arthritis and iritis, currently treated with etanercept (Enbrel) injections and calcipotriene (Dovonex) ointment. She reported no recurrences of iritis since starting Enbrel injections in 2000. She was a non-smoker and had no drug allergies. She was oriented to person, place and time. Figure 1. 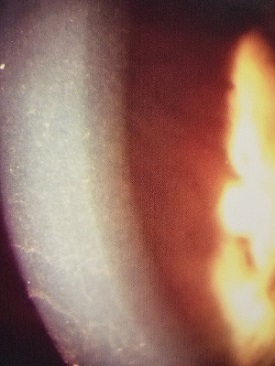 Image of the patient’s cornea, showing gold deposits, captured at the slip lamp using an iPhone 5. Best-corrected vision was 20/15 OD with +0.25-0.50×030 and 20/15 OS with +0.50-0.50×015 at distance and 20/20 OU at near with a 2.50 add. Cover test was measured to be orthophoria at distance and 4 exophoria at near. Extraocular motility was full with no pain or diplopia. Pupils were equal, round and reactive to light with no afferent defects. Visual field was full based on screening with frequency doubling perimetry. HRR (Hardy Rand and Rittler) color vision screening was normal in each eye. Slit lamp examination revealed yellow-brown glistening gold deposits in the stroma of each cornea. (Figure 1). No discoloration of the skin of her face or elsewhere was noted. The anterior chamber was clear, without cells or flare. Goldmann applanation tonometry was 11 mmHg in each eye. Dilated fundus examination was performed using one drop of 1% tropicamide in each eye. Crystalline lenses of both eyes showed trace nuclear sclerosis. The vitreous humor was clear in each eye. Optic nerves were a healthy pink color, and cup/disc ratios were 0.30/0.30 in the right eye and 0.35/0.35 in the left eye with distinct margins. Maculae were normal without degenerative or pigmentary changes. Retinal blood vessels showed no hypertensive changes. Peripheral retinae were flat with no holes, breaks or tears. Upon further questioning, the patient reported originally being diagnosed with rheumatoid arthritis in 1985. Treatment with the gold injection Solganol was initiated at that time. After a year of treatment, injections were switched to Myochrysine until therapy was discontinued in 1987 due to pregnancy. A short Myochrysine treatment course of a couple of months was administered after the conclusion of the pregnancy in 1988. The oral gold medication Ridaura was also tried during chrysotherapy but was immediately discontinued due to gastrointestinal intolerance. In total, the patient had received 1935 mg of gold salt injections. However, the severity of the arthritis decreased drastically during a second pregnancy and never returned to its pre-pregnancy severity. In 1992, plaque-like seborrhea of the scalp developed and the diagnosis was changed to psoriasis with psoriatic arthritis. What is the definition of chrysiasis vs. ocular chrysiasis? What conditions have gold salts (chrysotherapy) been used to treat? How would you educate patients with chrysiasis about their condition and prognosis? Should a patient with ocular chrysiasis discontinue gold salt treatment? What is the natural course of ocular chrysiasis? How would you manage the ocular symptoms for the patient in the case report? What history questions should be asked of patients presenting with anterior segment crystalline deposits? In the absence of inflammation, there is no necessary treatment or management for ocular chrysiasis as the deposits typically do not cause decreased visual acuity or other symptoms. UV protection may assist with reducing glare. However, it is necessary to monitor for changes and differentiate the condition from other corneal pathology. Although this condition can be noticed visually, it should not be detrimental to vision. The key to diagnosis is thorough patient history to identify any autoimmune conditions or history of chrysotherapy. Location of the deposits is likewise important for ruling out other corneal pathologies. Ocular chrysiasis should be considered in any patient who has undergone chrysotherapy if abnormalities within the cornea or lens are noted. Several differential diagnoses should be considered if corneal deposits are observed. The appearance and location of the deposits will aid correct diagnosis. Ocular chrysiasis is a condition associated only with use of gold salts for treating autoimmune conditions. It is becoming increasingly rare as newer and safer therapies for rheumatoid arthritis are developed. It is important to include ocular chrysiasis as a differential in the presence of crystalline keratopathies whenever gold therapy has been administered. A detailed medical history and thorough ocular examination can assist in arriving at the correct diagnosis. Ahmed SV, Sajjan R. Chrysiasis: a gold “curse”! BMJ Case Reports 2009. Available from: http://casereports.bmj.com/content/2009/bcr.07.2008.0417.full. Norn S, Permin H, Kruse PR, Kruse E. History of gold-with Danish contribution to tuberculosis and rheumatoid arthritis. Dan Medicinhist Arbog 2011;39:59-80. Crawford JCC. Chrysotherapy in the treatment of rheumatoid arthritis. Ulster Journal of Medicine. 1937 Jan;6(1):29-32, 33-34. Devaux G. From photography to chrysotherapy: Fordos and gelis salt. Revue d’Histoire de la Pharmacie. 1999;47(323):347-54. Eisler R. Chrysotherapy: a synoptic review.” Inflammation Research. 2003 Dec;52(12):487-501. Tierney DW. Ocular chrysiasis. J Am Optom Assoc. 1988 Dec;59(12):960-2. Singh AD, Puri P, Amos RS. Deposition of gold in ocular structures, although known, is rare. A case of ocular chrysiasis in a patient of rheumatoid arthritis on gold treatment is presented. Eye. 2004;18:443-444. Prouse PJ, Kanski JJ, Gumpel JM. Ocular chrysiasis and clinical improvement with chrysotherapy in rheumatoid arthritis. Ann Rheum Dis. 1981 Dec;40(6):564-6. McCormick SA, DiBartolomeo AG, Raju VK, Schwab IR. Ocular chrysiasis. Ophthalmology. 1985 Oct;92(10):1432-5. Bartlett JD, Jaanus SD. Clinical ocular pharmacology fifth Edition. St. Louis: Butterworth-Heinemann, 2008. Pgs. 710, 713. Gottlieb NL, Major JC. Ocular chrysiasis correlated with gold concentrations in the crystalline lens during chrysotherapy. Arthritis Rheum. 1978 Jul-Aug;21(6):704-8. Raj A, Williams GP, Hawksworth NR. Ulcerative keratitis following particulate elemental gold deposition. J Ocul Pharmacol Ther. 2012;28(3):323-325. Paladini I, Menchini U, Menccucci R. Corneal chrysiasis: in vivo confocal microscopy analysis. Eur J Ophthalmol. 2010;20(4):776-779. Kanski JJ, Bowling B. Clinical Ophthalmology: A Systematic Approach 7th Edition. St. Louis, GB: Saunders, 2011. ProQuest ebrary. Web. 22 February 2017. Pgs. 230, 357-359, 660. 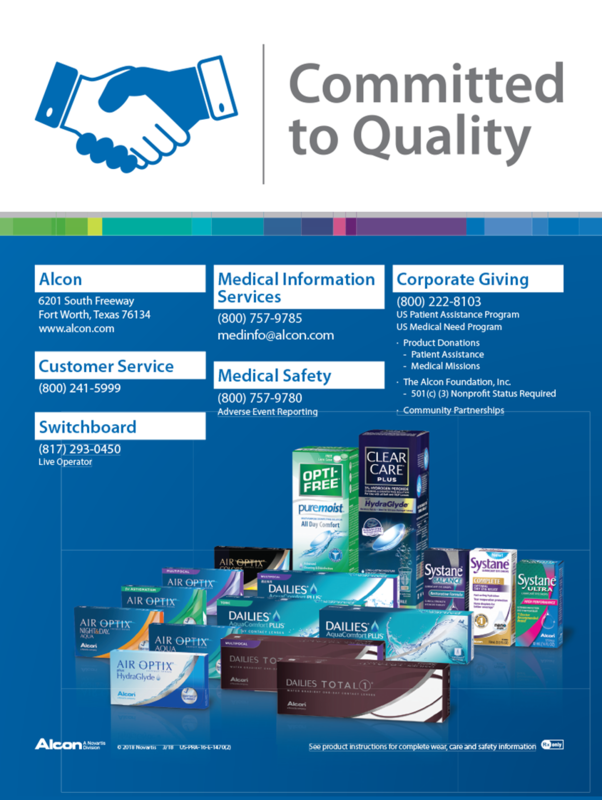 Dr. Larson [mlarsonod@gmail.com] is an independent optometrist practicing in Colorado. He is a graduate of the Indiana University School of Optometry, where he also completed a residency in Primary Care and Ocular Disease. His areas of interest include primary care and the treatment and management of infections and uveitis. Dr. Klemencic is an Associate Professor at the Illinois College of Optometry/Illinois Eye Institute. Dr. Peabody is an Associate Clinical Professor, Associate Dean of Institutional Advancement, and Director of Continuing Education at the Indiana University School of Optometry. OPTOMETRIC EDUCATION is published by the Association of Schools and Colleges of Optometry (ASCO).